Work by class of 2010 alumni Dina Litovsky was recently featured in the story, Where the Amish Go on Vacation in the New Yorker; alongside writing by Alice Gregory. Two women pass by a mural depicting the ideal of the Amish life back home. 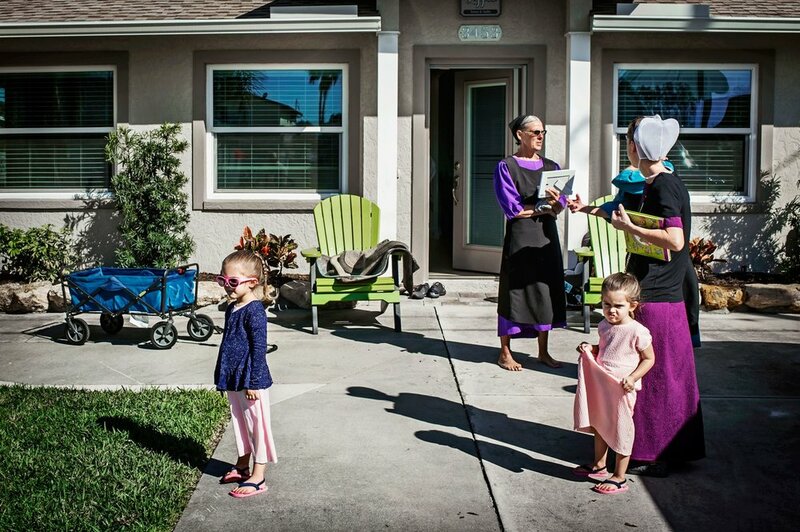 Each winter, for close to a century now, hundreds of Amish and Mennonite families have travelled from their homes in icy quarters of the U.S. and Canada to Pinecraft, a small, sunny neighborhood in Sarasota, Florida. Arriving on chartered buses specializing in the transportation of “Plain people” from areas such as Lancaster, Pennsylvania, and Holmes County, Ohio, they rent modest bungalows and stay for weeks, or sometimes months, at a time. It’s vacation. For many, it’s the one time of the year that they spend with people from communities other than their own. The front yard of a family home. Originally drawn to Pinecraft’s affordable real-estate prices and off-season farming potential, the first Amish families began coming in the mid-nineteen-twenties, with the idea of growing celery. They found the soil disappointing, but not the comparatively languid life style. Now, without barns to raise or cows to milk or scrapple to prepare, the typically stringent rules of Anabaptist life are somewhat suspended in Pinecraft, an inland neighborhood that in recent decades has expanded to more than two hundred and eighty acres. Earrings, usually forbidden, can be seen glittering from beneath white bonnets, and houses are outfitted with satellite dishes. Horses and buggies are nowhere to be seen, but adult-sized tricycles abound. Swimming, volleyball, and shuffleboard are encouraged; ice-cream cones are a nightly ritual. 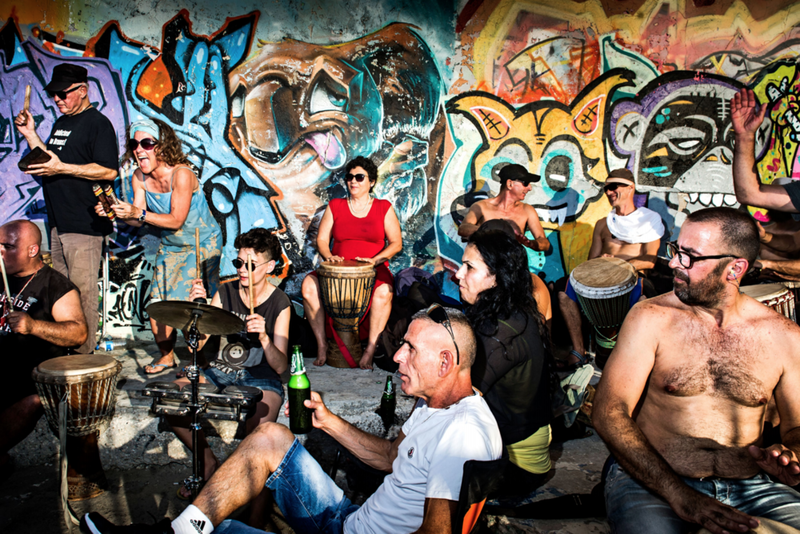 To continue reading the writing by Alice Gregory and to see more of Dina Litovsky's photographs, please click here. 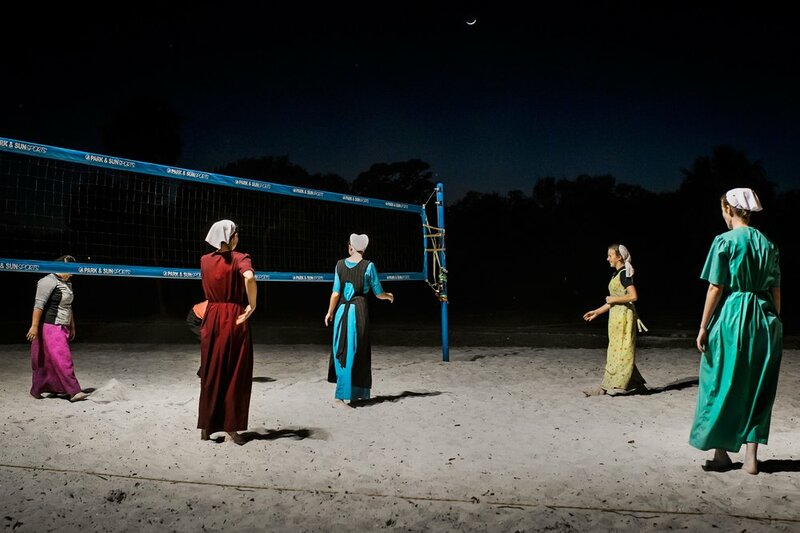 The nightly women’s volleyball game is the community’s main spectacle.